HOW on earth does all the plastic get into the oceans? There is a patch of plastic in the Pacific Ocean the size of Europe. There are even more garbage patches in the ocean… If we keep up, there will be more plastic than fish in the ocean by 2050. Every minute literally 1 ton of plastic makes its way into the ocean. What’s the problem with plastic in the ocean? Friday last week I had the pleasure to attend the blogger workshop on plastic pollution in the oceans, hosted by the NPO Whale & Dolphin Conservation. Most of it I had already heard or read. But it was definitely something else to have a marine biologist explain it and to be able to ask some more questions. Ghost nets, for example, are drifting fishing nets that have been lost or “disposed of”. Sea creatures often get entangled in the nets and are injured or starve to death. I did know that, but it still shocked me to hear that it usually takes months, because both whales and dolphins have a lot of body fat. They are highly intelligent so they know that all they can do is to drift and die a slow death. More on the topic here. I really enjoyed the workshop that brought together people from different areas: animal protection, food, zero waste, travelling, lifestyle, beauty, fashion, and business. It was so inspiring and great to meet everyone ! Did you know that 80% of the plastics in the ocean comes from land-based activities and not from what is thrown or lost overboard from ships? It is trash blown from the streets, trash cans, or landfills into rivers, sewers, or directly into the ocean. However, it is also microplastics from products like toothpaste or from washing your clothes made from or with synthetic fibres! I always thought that throwing my trash into trash cans and dumpsters meant that I could prevent that. While this does help, there is no guarantee none of it will not end up in the huge Pacific garbage patch. Just a couple of months ago we visited a waste management facility, and I snatched this photo of open containers full of plastic trash right out in the open where some of it can easily be blown away. There are also trash mountains at the harbor right next to the water, waiting to be loaded onto a ship. Guess what – of course a part of it will get blown right into the rivers or the sea! Preventing plastic waste from happening in the first place is of course the best method to nip the problem in the bud. Don’t buy or use cosmetics that contain microbeads! Your product contains microbeads if it lists one of the followings as an ingredient: polyethylene, polypropylene, polyethylene terephthalate or polymethyl methacrylate. Prefer natural over synthetic fibres when buying new (or pre-owned) cloths. Don’t throw trash onto the street (nope, no cigarette buds either), and do pick up a thing or two when you walk past loose trash on the street. Shia, this post is great, and that first video is a great visual for our plastic problems. I just wish people would WAKE UP and re-think their plastic use NOW instead of later. As a teacher, I see every day how children are raised to use plastic as a daily disposable, like it is the most un-harmful thing to do. Their sandwiches are wrapped in clingwrap, their daily yogurt containers are thrown away, and they even get plastic spoons sent with them to eat said yogurt or pudding. It pains me that children are raised with such nonchalance for environmental impacts, when it is more important than ever to be paying attention to such issues. It is so sad that what we do is viewed as “extreme” – shouldn’t it be the other way around? Isn’t it extreme to wrap your kid’s lunch in layers and layers of disposable plastic, even though plastic is harmful both to our health and the planet? Isn’t it extreme that we have almost used up all of our planet’s resources in the past 60 years, even though these resources took millions of years to form? I agree with you completely. I can’t believe the weird looks I get sometimes. A colleague of mine once saw me eating with a bamboo fork on a class field trip and started laughing at me and said, “Why are you using bamboo cutlery?” So I explained. “So do you only own bamboo cutlery?” Umm… and then another colleague chimed in and actually made fun of me for it, while they were using plastic forks for their meal, which got thrown in the garbage afterward. How am I the odd one?! Plastic cutlery. COME ON. *frustrated*. You can use plastic forks over again. I do it all the time. I don’t believe such vast amounts of plastic gets into the oceans by accident but it must be dumped there deliberately. Individuals and countries responsible must be named and shamed. I’m nearly 50 and growing in the 70s and 80s we use to have far more paper used for packaging. Then there was the save the trees issue. So plastic has exploded… I’m scared of the incredible waste of plastic. We have the alleged recycling the council runs. But how much is actually recycled? Not sure. Also worried now about the plastic especially used for microwave foods. Is it safe ,? Ahhhhhhhhh so much waste. It’s terrifying. Price for convenience I suppose. I think of good old Jeff goldblum in jurrasic park where he recycles the drink container. No one has followed his example have they ? I was blown away when I heard that in the ocean around the US they actually just made it illegal to drop waste into the ocean in the early 1970ties….that means before that its actually been like a normal thing that they dropped waste into the ocean. Like Peter says, I can’t believe tons & tons of plastic bottles get blown away into the rivers & seas. Why not get to the real root of this problem and give us proper information on how we end up with tons of plastic in the oceans. Surely this is being done at an industrial level by various countries that don’t have strict laws on where they dump rubbish? I thought so as well, and living far inland we don’t throw trash on the beach. And surely those on our West coast are much more aware and don’t allow much to get into the ocean. I could be wrong. I came onto this site to find out WHY we have oceans full of plastic. I too thought that by recycling this problem would right itself. Its got worse! Everything I buy that is plastic or whatever, after use, goes in a bin, either for recycling or for council disposal. I also find it hard to believe that the plastic and waste in our oceans is blown there. Surely not. Tell us the truth please. We need to know, if our councils are responsible , or if by and large we just drop litter willy- nilly, to be blown away . Manufacturers need to get their act together too. and stop packaging in plastic. (Its damned hard to get into some things these days). I agree with ‘Jon’ . 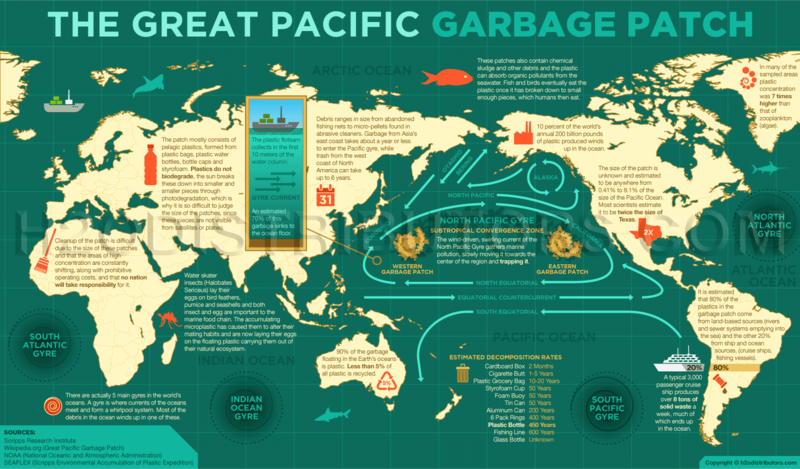 In addition to whatever source based reduction we can make how about a ship goes out in the Pacific, and recycles all that stuff that is out there just waiting to be recycled. Sure it would not be a profit, but it would directly impact the real issue. I was watching in horror, a big boat with a crane on it, in Paphos cyprus a few years ago. About half a mile or so out. It had a huge pile of rubbish on it. A grabber picked up a load of it and dumped it in the sea on the sea bed!!!!! !i was mortified. Over and over again. Governments try and blame us for dropping waste etc and its them throwing it into the sea………errrrrmmmm. .????? Seriously? Furious! I think they need to prevent landfills from emptying into the oceans! That would prevent most of the plastic and trash getting there! And make more plastic biodegradable! I’m sure it can be done! Doing away with plastic isn’t the answer!